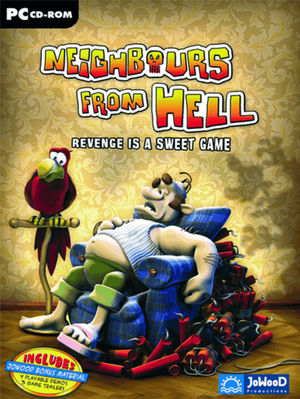 Includes Neighbours from Hell 2: On Vacation. Edit %USERPROFILE%\Documents\JoWooD\NFH1\gameoptions.xml and set fullscreen="false"
Delete or rename the sfxdata.bnd file. Copy the sfxdatahigh.bnd file and paste it in the same location. 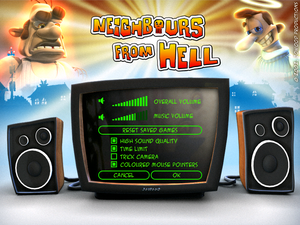 Regardless of the settings, the sound quality will be high. The game data is stored in <path-to-game>\data\gamedata.bnd This file is actually a ZIP archive with XML game data inside. ↑ 1.0 1.1 File/folder structure within this directory reflects the path(s) listed for Windows and/or Steam game data (use Wine regedit to access Windows registry paths). Games with Steam Cloud support may store data in ~/.steam/steam/userdata/<user-id>/260750/ in addition to or instead of this directory. The app ID (260750) may differ in some cases. Treat backslashes as forward slashes. See the glossary page for details. ↑ GOG.com Community Discussions - Windows 7 compatible? This page was last edited on 20 March 2019, at 04:13.